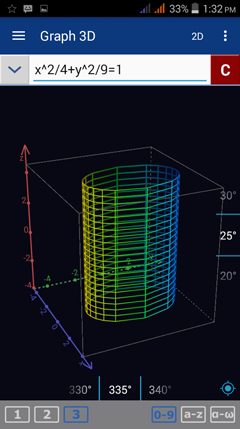 The App provides both 2D and 3D workspaces to create graphs. 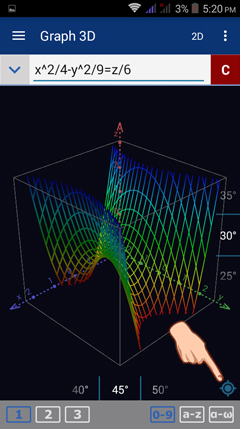 The default graph window is 2D. 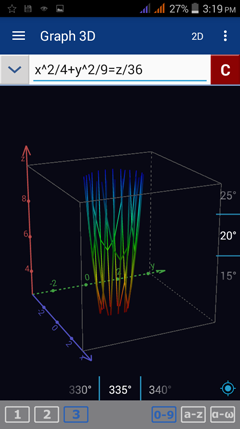 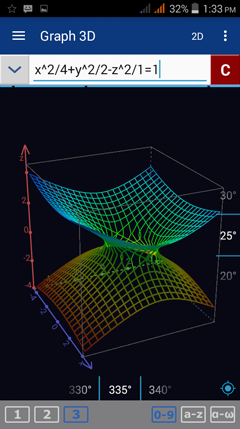 To graph an equation in 3D (space figure), tap the 3D button in the top right next to the options button. 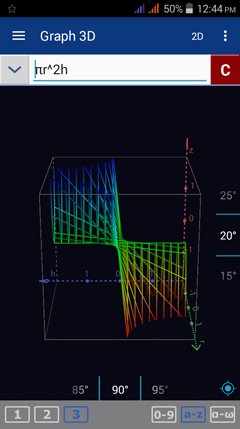 Tap it again to go back to a 2D graph workspace. 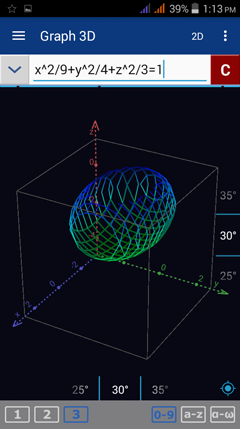 The 3D graph window allows you to sketch the graph of any equation defined in terms of x, y and z (or any other 3-variable combinations). 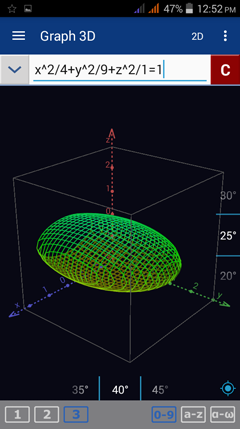 For explicitly defined equations such as V = (pi)(r^2)(h), just type the expression: (pi)(r^2)(h) in the input field. 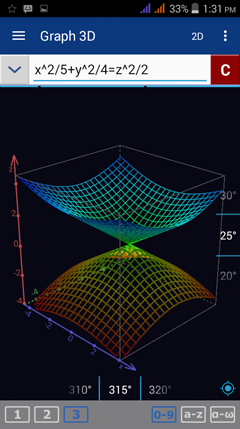 For implicitly defined equations such as x^2/4 + y^2/9 = z/36, enter the entire equation as demonstrated below. 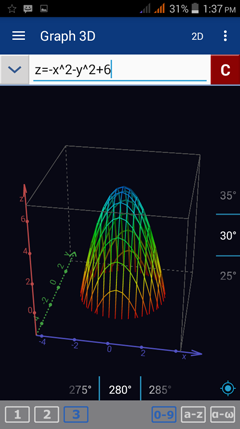 ​If you can't see your graph displayed after entering the equations, pinch or stretch the graph area to change the size of the coordinate axis (x, y or z) until the graph is visible. 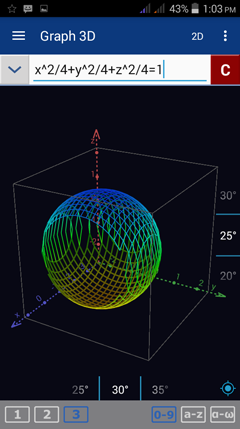 This is because the default coordinates may be too far from the domain of the graph. 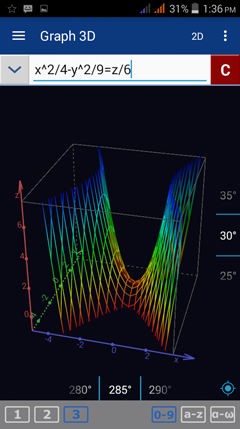 You can also adjust the angle of inclination of the default 3D axes to have a better view of the graph and see how its shape changes over a certain angle or interval of values. 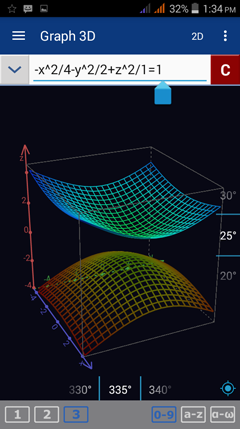 Tap the vertical or horizontal angles of the graph to choose a side that you want to view more closely. 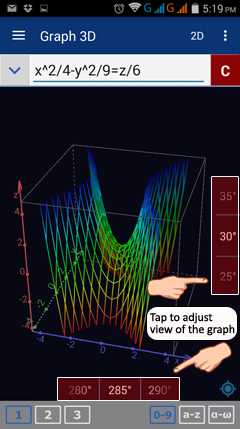 If you decide that you want to see the graph in its original size again, tap the blue button in the lower right-hand corner of the screen as highlighted below. 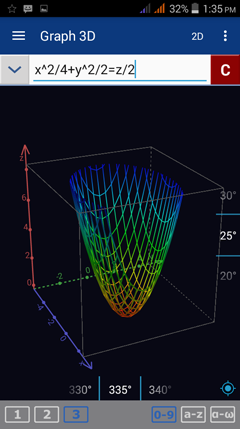 The app will automatically display the original size of the graph being sketched. 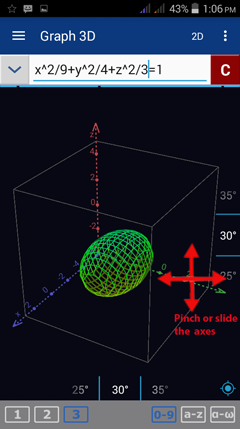 Shown below are some common 3D shapes discussed in higher Calculus.